Tim PETTIGREW, the owner of All-Affordable Termite and Pest Control, started the company in 1993 with only a couple of hundred dollars in the bank and an "old beat-up" car. With Tim's 13 years of termite and pest control experience along with God's grace, the company has grown to 4 service trucks, serving several thousand customers per year in the Ft. Bend, Harris, Brazoria, Austin, and Wharton counties of Texas. Here at All-Affordable we are extremely proud of our growth rate because we have prided ourselves on honest and quality customer service at affordable prices. This has been, and will continue to be, our goal. 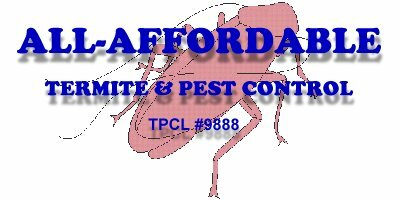 All-Affordable Termite and Pest Control is a member of many civic and local organizations as well as state and national organizations. We support the Ft. Bend County Fair and the Houston Livestock Show and Rodeo, which both provide scholarships to the young people of our community. We are committed to the safety and well-being of our customers because they are, also, our neighbors and friends. Everyone wants their family to be happy and healthy. What most people don't realize is that insects and rodents are major carriers of bacteria and disease. The solution to this problem is to have a professional rid your home of these pests. The products used by All- Affordable are approved by the Environmental Protection Agency for you, your children, and your pets protection. 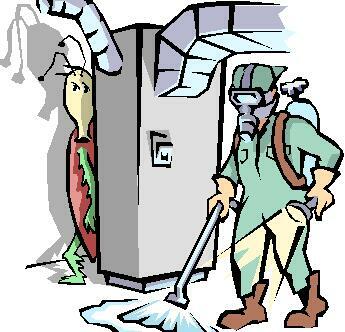 QUARTERLY "DE-BUG" TREATMENT Special: $45.00 (initial service) plus tax of $3.71 = $48.71 Guaranteed for 60 days from treatment date. Wood-destroying insects, fleas, and fire-ants in yard. Your home is probably the largest investment you will ever make, so it stands to reason that you would want to protect it from damage. Termites and other wood-destroying insects cause homeowners millions every year in southeast Texas alone. Your home doesn't have to be part of this statistic. For a reasonable cost, we at All-Affordable can give your investment the protection it deserves. Don't put it off, call today for a free quote! Ask about our $300,000 repair and replacement policy! Free termite inspections and estimates.